HP Splits in Two: Hewlett-Packard Enterprise and HP Inc. The time has long since past when a computer manufacturer could get by on shipping tin. The margins on computer equipment are so low that, most of the time, the equipment they sell is just a loss leader for another part of the business. Nowadays the vast majority of most large computer company’s revenue comes from their services division, usually under the guise of providing the customer a holistic solution rather than just another piece of tin. Thus for many companies the past couple decades have seen them transform from pure hardware businesses into more services focused companies, with several attempting more radical transformations in order to stay relevant. HP has become the most recent company to do this, announcing that they will be splitting the company in half. HP will now divest itself into 2 different companies. The first will be Hewlett Packard Enterprise comprising of their server market, services branch and software group. The second will be purely consumer focused, comprising of their personal computer business and their printing branch. If you were going to split a PC business this is pretty much how you’d do it as whilst these functions are somewhat complimentary to each other (especially if you want to be the “end to end” supplier for all things computing) there’s just as many times when they’re at odds. HP’s overarching strategy with this split is to have two companies that can be more agile and innovative in their respective markets and, hopefully, see better margins because of it. When I first heard the rumours swirling about this potential split the first question that popped into my head was “Where is the services business going?”. As I alluded to before the services business is the money maker for pretty much every large PC manufacturer these days and in this case the enterprise part of HP has come away with it. The numbers only give a slight lead to the new enterprise business in terms of revenue and profit however with the hardware business has been on a slow decline for the past few years which, if I’m honest, paints a bleak picture for HP Inc. going forward. There’s nothing to stop them from developing a services capability (indeed parts of the consumer business already have that) however in its current form I’d put my money on HP Inc. being the one who’s worse off out of this deal. That could change however if HP’s rhetoric has some merit to it. HP, as it stands today, is an amalgamation of dozens of large companies that it acquired over the years and whilst they all had a similar core theme of being in the IT business there really wasn’t a driving overarching goal for them to adhere to. The split gives them an opportunity to define that more clearly for each of the respective companies, allowing them to more clearly define their mission within each of their designated market segments. Whether that will translate into the innovation and agility that they’re seeking is something we’ll have to see as this is yet another unprecedented change from a large IT conglomerate. As someone who’s been involved in the IT industry for the better part of 2 decades now the amount of change that’s happened in the last couple years has been, honestly, staggering. 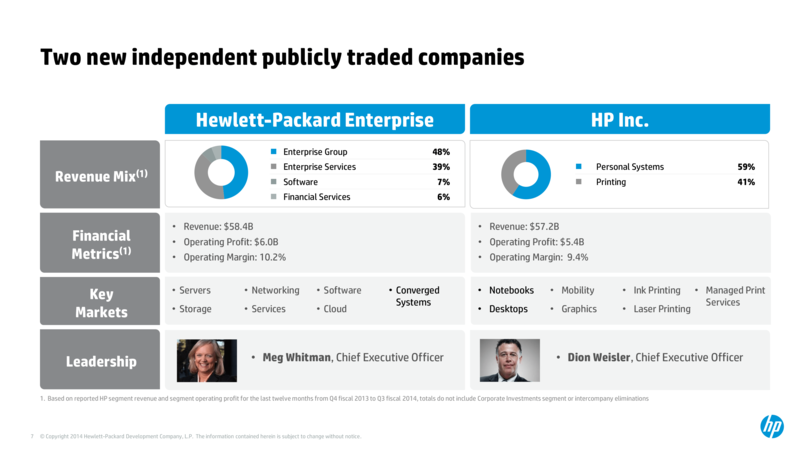 We’ve seen IBM sell off some of its core manufacturing capability (the one no one got fired for buying), Dell buy back all its stock to become a private company again and now HP, the last of the 3 PC giants, divest itself into 2 companies. It will likely take years before all the effects of these changes are really felt but suffice to say that the PC industry of the future will look radically different to that of the past. FULL DISCLOSURE: The writer is a current employee of Dell. All opinions expressed in this article are of the writer’s own and are not representative of Dell. Solid State Drives, Not Just All Talk. Last year Intel made headlines by releasing the X25-E, an amazing piece of hardware that showed everyone that it was possible to get a large amount of flash and use it as a main disk drive without having to spend thousands of dollars on custom hardware. Even though the price tag was even outside most enthusiasts price ranges it still came out as the piece of hardware that everyone wanted and dreamed about. Fast forward a year and several other players have entered the SSD market space. Competition is always a good thing as it will lead to companies fighting it out by offering products at varying price points in order to entice people into the market. However, although there appeared to be competition on the outside a deeper look into most of the other drives showed that they shared a controller (from JMicron, the JMF602B MLC) except for Samsung and Intel. Unfortunately these drives focused on sequential throughput (transferring big files and the like) at the cost of random write performance. This in turn made all operating systems that were installed on them appeared to freeze for seconds at a time, since any Operating System is constantly writing small things to disk in the background. However, thanks to a recent AnandTech reviewer, one company has stepped up to the plate and addressed these issues, giving a low cost option (circa $400 for a 60GB drive, as oppose to Intel’s $900 for 32GB) for people wanting to try SSDs but not put up with a freezing computer. One of my tech friends just informed me that a recent update to the firmware of the drive saw improvements up to 3~4 times that of the original drive, an amazing improvement by any metric. So are these things worth the money? Pretty much everyone I’ve talked to believe they are. These things really aren’t meant to be your main storage drive and once the paradigm shifts from disks being slow I believe you’ll see many more systems built around a tiered storage arrangement. Have your OS and favourite applications on the SSD and keep your giant lumbering magnetic disks trundling along in the background holding all your photos, music and the like. There’s always been a strong disconnect between the blistering fast memory of your computer when compared to the slow crawl of the hard disk and it would seem that SSDs will bridge that gap, making the modern PC a much more usable device. I am fortunate enough to be working with some of the latest gear from HP which includes solid state drives (for work, of course! :)). For the hardware geeks out there we’ve just taken delivery of 2 HP C7000 Blade Chassis, 4 BL495c FLEX10 blades with 32GB of memory and dual 32GB SSD drives (they’re Samsung SLC drives) and all the bibs and bobs that are needed to hook all this up as our new VMware environment. It is a pity that they won’t let me put them together myself (How dare they tempt a geek with a myriad of boxes of components!) but I can understand my boss’ requirements of having someone else do it, just so we can blame them should anything go wrong.